We are happy to announce that Overman Foundation has received permission from Sri Aurobindo Ashram Trust to publish the 1936-37 version of Sri Aurobindo’s Savitri in its online forum. We are extremely grateful to Shri Manoj Das Gupta, Managing Trustee of Sri Aurobindo Ashram Trust, for giving us the said permission. The first installment of the 1936-37 version of Savitri has been published in the online forum of Overman Foundation. Mute with the unplumbed prevision of her change. The impassive skies were neutral, waste and still. Then a faint hesitating glimmer broke. And beauty and wonder disturbed the fields of God. A gate of dreams ajar on mystery’s verge. As if a soul long dead were moved to live. And slow creation laboured out once more. Yet the undying Ray took shape on high. Its lustre vanishing in the inconscient planes. Almost was flung upon the opaque Inane. But through that little the ancient Marvel shines. Once more a tread perturbed the vacant vasts. Then, thoughtful, turned to her immortal work. Our prostrate soul bore the awakening Light. Dimmed, fading slowly from the mortal’s range. The prescience of a marvellous birth to come. Renewed the cycles of the blinded quest. Man lifted up the burden of his fate. Acclaimed their portion of ephemeral joy. No part she took in their small happiness. Its message of brief light shone not for her. The embodied Guest within made no response. The deathless conquered by the death of things. Could stand not on this brittle earthly base. Its passion-flower of love and doom it gave. To the lone immortal’s unshared work she rose. At first life ached not in her burdened breast. Deep, quiet, old, made natural to its place. The unassisted brain found not its past. Only some vague earth-nature held the frame. Across the ebbing of the seas of sleep. And the tired feet of thought approached her doors. That saw grief’s timeless depths but not life’s goal. The daily oblation of her unwept tears. Began again beneath the eternal Hand. And heard the ignorant cry of living things. Immobile in herself, she gathered force. This was the day when Satyavan must die. Awhile she moved in the many-imaged past. Flew by her eagle-winged through memory’s skies. Then this new turn where Heaven raced with Hell. Measuring her depths with his all-seizing Night. In the closed beauty of the inhuman wilds. There was no witness of terrestrial eyes. Were the spectators of that mighty strife. Muttering incessantly their muffled spell. Her drama’s radiant prologue here she had lived. Love came to her hiding the shadow, Death. Well might he find in her his perfect shrine! A lightning from the heights on our abyss. All in her pointed to a nobler kind. O’erflew the ways of Thought to unborn things. Passionate in flow, had not one turbid wave. Or golden temple-door to things beyond. Poured a supernal beauty on men’s lives. The great unsatisfied godhead here could dwell. For even her gulfs were secrecies of light. An ocean of untrembling virgin fire. And moved in her as in his natural home. Carried on canvas strips of shimmering Time. The impunity of unborn Mights was here. Drifting with burning wings above her days. But joy cannot endure until the end. That will not suffer long too glad a note. The armed Immortal bore the snare of Time. One dealt with her who meets the burdened great. Whose sanction he obeys as him our fates. Calling to fill with her vast self the abyss. He used the Spirit’s dreadful strategy. And forced her strength to its appointed road. And life’s brief struggle in dim Matter’s night. But not to accept and suffer was she born. A chattel and a plaything of Time’s lords. A conscious Frame was here, a self-born Force. Too high the Fire spiritual dare not blaze. And earth sink down with the weight of the Infinite. Guard the Wheel’s circling immobility. And the gold Hawk can cross the skies no more. But one stood up who lit the limitless flame. Admitting without appeal the nether Gods. And burst the bonds of consciousness and Time. From Sri Aurobindo’s Notes: “This First Book is divided into sections and the larger sections into subsections… The first section is ‘The last Dawn’, i.e., the dawn of the day of Satyavan’s death, (but it must be remembered that everything is symbolic or significant in the poem, so this dawn also,) the next is ‘The Issue’; both of these are short. Then comes a huge section of the Yoga of the Lord of the Horse (Aswapati, father of Savitri) relating how came about the birth of Savitri and its significance; finally the birth and child¬hood of Savitri” (26.10.1936). Shortly after August 1910, on exile from British India at the French enclave of Pondicherry, Sri Aurobindo wrote a rejoinder to an article entitled ‘Comment and Criticism: The Indian Fine Arts critics’, earlier published in The Modern Review of Calcutta (Vol. 8, No.2, pp. 207-13). The Review’s editor identified the author of the article as ‘a student of Ravi Varma, (1848-1906) the famous Indian artist.’ While defending Varma, the article made disparaging remarks against critics such as Ananda K. Coomaraswamy and Sister Nivedita. The text of Sri Aurobindo’s rejoinder was incomplete and the piece remained unpublished during his life time. However, its contents are worthy of critical attention since these are in line with much of what he wrote on the subject around this time. It illuminates our understanding of several issues of the day and draws attention to unresolved questions of postcoloniality, and contemporary cultural criticism. These include our understanding of the relationship between traditions and modernities, usable traditions and unusable modernities, religious nationalism and secular modernity, cultural continuities/universals vis-à-vis cultural specificities, and finally, the ‘Mission’ and ‘uniqueness’ of cultures versus cultures seen as socio-historical and political constructs. While I shall allude to some of the above in the course of my essay, I shall primarily focus on the role of the arts in the polemics of decolonisation used by two kindred spirits of the early 20th century; namely Sri Aurobindo and Ananda Coomaraswamy. While postcolonial critics such as Edward Said, Homi Bhabha, Gayatri Spivak, Aizaz Ahmed, and others have unveiled the colonial cartography in ample measure, there seems to be a surprising omission of the earlier narratives of decolonisation during the early part of the 20th century. Many of these seem to belong to the dominant religious/spiritual traditions of the day. Later and more recent approaches have preferred the secular and cultural materialist position. Modern systems of thought have not paid adequate attention to the question of faith and the notion of the sacred. The upsurge in religious fundamentalism world wide could be one of the many factors that may have caused an intellectual weariness to handle this question. I shall argue in this essay that there is a need to come up with an alternative theory. For; the omission has impoverished postcolonial theory significantly. It has ignored a vital world view and a significant part of the cultural history of South Asia. For my purpose, I shall therefore take up for closer study the art criticism of Ananda Coomaraswamy and Sri Aurobindo against the backdrop of decolonisation that was central to both the figures. There are remarkable parallels (and notable differences) between Sri Aurobindo (15 August 1872 to 5 December 1950) and Ananda Coomaraswamy (22 August 1877 to 9 September 1947). Their life span makes them contemporaries. Both came from the upper class/caste background and both were products of the modern West. Coomaraswamy’s parents were the Ceylonese Tamil legislator and philosopher Sir Muthu Coomaraswamy and his English wife Elizabeth Beeby. Young Coomaraswamy lost his father at the age of two and was educated and brought up abroad. Moving to England in 1879, at the age of 12, he attended a preparatory school in Stroud, Gloucestershire and graduated from University College, London in 1900 with a degree in Geology and Botany. On 19 June 1902, Coomaraswamy married Ethel Mary Partridge and moved to Ceylon. His contributions to mineralogy led to the formation of the Geological Survey of Ceylon which he headed for some time. After his divorce and second marriage to an English woman who performed on stage in the name of Ratan Devi, he moved to the United States to serve as the first keeper of Indian Art in the Museum of Fine Arts in Boston in 1917. He had two more marriages, to American artist Stella Bloch in November 1922 and Argentine Luisa Runstein in November 1930. He was a distinguished member of the art circle in New York City, and a close friend of the artist Alfred Stieglitz. In 1933 he became a Fellow for Research in Indian Persian and Mohammedan Art at the Museum of Fine Art. He wrote more than thirty books on art, sculpture, art history, architecture, philosophy, metaphysics, and East-West Relations and undoubtedly ranks as one of the best known exponents of Indian arts in the West. His middle name ‘Kentish’, marker of a valorised English pedigree and culture, generally unnoticed in his later career, might signify a dethronement of one’s colonial past. Both in his life and vocations, he stands at the cross roads between tradition and modernity, East and the West. He stood for values described as inalienably ‘Indian’ and yet chose places of work and life companions who went beyond national boundaries and political frontiers. He was synthetic and universal in outlook. Part of the close circle of Rabindranath Tagore, he chose the art galleries and museums of the advanced West as the place of work and dissemination of ideas. His many lives flowed effortlessly from nationalism to cosmopolitanism, based on the primacy of the arts. From the English soil he seems to draw sustenance from Victorian critics like, Mathew Arnold, John Ruskin, and Dante Gabriel Rossetti in the latter’s faith in the centrality of art in the Victorian Society. There are also the influences of the earlier historical periods such as the Hellenic, the European Renaissance and other civilization of the World such as the ancient, the pre-colonial India that underlined the importance of the arts and aesthetics in national life. Blake’s vision of a new Hellas or a New Jerusalem that marks the fusion between art and the New World would be a favoured ideal for Coomaraswamy. Coomaraswamy’s ideas, beliefs and life values, both artistic and creative, were not derivative. He assimilated influences both old and new and forged approaches that were innovative and creative. Coomaraswamy’s better known counterpart in this essay, Sri Aurobindo, had an equally anglicised upbringing and carried an English style middle name, ‘Akroyd’, after his father’s friend Annettle Akroyd, the founder of the Brahmo girls’ school in Calcutta (Heehs:7). Aurobindo’s parents were Kristo Dhone Ghose (or K. D. Ghose) and Swarnalotta, daughter of Rajnaryan Basu, a leading member of the Brahmo Samaj and Bengal Renaissance. K.D. Ghose who earned a degree of M.D from Aberdeen University, U.K. was thoroughly anglicized and wanted his children to follow his footsteps. Like Coomaraswamy, Sri Aurobindo and his brothers, particularly Manmohan and Barindra Kumar were denied maternal affection .Soon after Aurobindo’s birth, Swarnalotta showed signs of mental disorder which persisted till the end of her life. At the Ghose household, no Indian languages including Bengali was spoken. The three children were admitted to the Loreto Convent, Darjeeling in 1877. Later in 1879, they were taken to Manchester and left under the care of a congregational Minister named William H Drewett who was asked by K. D. Ghose not to allow the children to ‘make the acquaintance of any Indian or undergo any Indian influence’. (Heehs: 9) Although an agnostic, K.D. Ghose insisted that his children ought to be left free to decide about the question of faith. In his childhood, Aurobindo remained an agnostic. After spending five years at Manchester, Aurobindo studied at St. Paul’s school, London in 1884 and King’s College, Cambridge in 1890. In 1892 he passed the ICS but did not appear at a riding test and was disqualified. Aurobindo arrived in Bombay on February 6, 1893 and joined the Baroda Service, first in the administration and then as a Professor of English and French at the Baroda College. By 1900, he turned attention to the National Freedom Struggle. He established contact with Secret societies in Maharashtra and Bengal. On 30 April 1902 he married Mrinalini Bose. He plunged actively into the Swadeshi Movement in 1905 over the Partition of Bengal and became the editor of Bande Mataram in 1906. He joined as the Principal of Bengal National College. In 1908 he was arrested in the Alipore Bomb Case and after a year in jail he was acquitted on 6 May 1909. After his acquittal he edited two journals Dharma and Karmayogin. 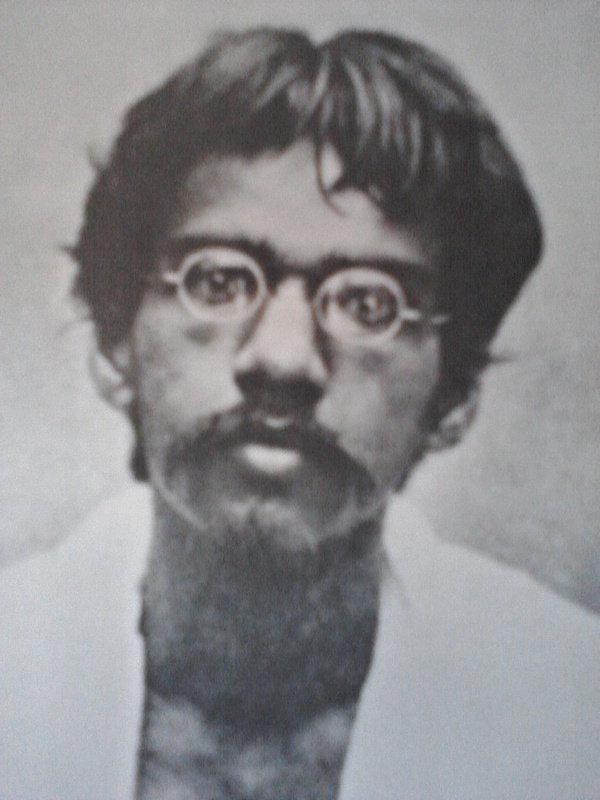 Following a divine command or ‘Adesh’ he reached Pondicherry on 4 April 1910. On 29 March 1914 he met, Mirra Alfassa later known as the Mother who became his spiritual collaborator. From 15 August 1914 to January 1921 the English monthly Arya carried his best known writings. On September 19, 1940, during the World War II, Sri Aurobindo declared support for Allies. He gave the Independence Day message on 15 August 1947 where he spelt out his vision of a new resurgent India and the future of humanity. Towards the end of his life, he devoted attention to his Magnum Opus, Savitri, and passed away on 5 December 1950. I have spent some time in drawing attention to the key aspects of the life histories of the two figures because I believe the main trajectories of their lives have a bearing on the decolonising agenda they championed. Sri Aurobindo is widely known as a nationalist, philosopher and mystic. He looked at himself primarily as a poet. His reputation as a spiritual Guru and Saint has somewhat eclipsed his considerably body of critical and cultural writings, a portion of which deals significantly with literature and the arts. As in the case of Coomaraswamy, Sri Aurobindo’s conceptions of art and his significant art criticism are to be seen as the inextricable part of his larger view of life of which decolonisation plays a crucial role. While the Ceylonese thinker’s writings on art are better known than his views on and participation in the political struggle for freedom, Sri Aurobindo’s nationalistic writings are better recognized than his art criticism. Even the more celebrated The Foundations of Indian Culture which appeared in the Arya from November 1918 to January 1921 which contains a significant body of criticism devoted to sculpture, painting, music and architecture have not received the attention they deserve among students of art history and comparative aesthetics. The chapter on Indian Art offers a comprehensive account on this subject. This and four other chapters gain significance from the opening chapter provocatively titled ‘Is India Civilized?’ The underlying argument is that all aspects of national culture including the arts have to be seen against the backdrop of the Indian nationhood. The discovery of the meaning of the Indian nation against the larger world civilisations is therefore an essential requisite for art criticism of both Coomaraswamy and Sri Aurobindo. There are at least three specific references to Coomaraswamy in the Collected Works of Sri Aurobindo (new edition), Early Cultural Writings, pp. 468-69. Renaissance in India, p. 255 and Karmayogin, pp. 244-48. Coomaraswamy’s best known work The Dance of Shiva was published by Sun wise Turn Press, New York in 1918 around the time Sri Aurobindo published The Renaissance in India, August-November 1918. The equally notable art criticism of Sri Aurobindo comprised the period between 1909 and 1910 and all of them, namely The National Value of Art, a series of six essays, ‘Two Pictures’, ‘Indian Art and an Old Classic’ and ‘The Revival of Indian Art’ appeared in the Karmayogin. Similarly two other essays in the form of reviews appeared in Arya. ‘South Indian Bronzes’ was published in the journal in October 1915 and in Views and Reviews since 1941. Likewise, ‘Rupam’ was published in the Arya in July 1917 and in Views and Reviews since 1941. Since the journal Arya enjoyed a good circulation and was widely noticed in nationalistic, philosophical and cultural circles, it would be fair to assume that Coomaraswamy and Sri Aurobindo were broadly aware of each other’s writings although we may not have enough knowledge regarding the actual correspondence between the two. Aside from The Foundations of Indian Culture and Early cultural Writings, Sri Aurobindo underlined his approach to decolonisation in The Secret of the Vedas where he gave a symbolic interpretation of the Vedas from the Indian point of view. Let me consider Coomaraswamy’s The Dance of Shiva from the points of my arguments implicit in the title of my paper. The book is divided into chapters that include, among others, the following: Indian Philosophy of life, View of art: Hindu and Buddhist, the Dance of Shiva, Status of Indian Women, Sahaja and Young India. Other categories are equally noteworthy: Pravritti Marga typified by outward movement, the path of pursuit and self assertion and Nivritti Marga, the path of return and inward self-realization. While this world view preaches equality among men and women, there cannot be absolute equality, because as Coomaraswamy argues, ‘variation of temperament or inheritance… constitutes the natural inequality of men, an inequality that is too often ignored by the theories of Western democracies’. India’s social institutions including the marriage systems, he adds, have wisely emphasized duties rather than rights. Here again, as in the case of the caste systems, Coomaraswamy seems to be less forthcoming about the pronounced inequity in the Indian society. The character of the world process follows a rhythmic process; subject-object, self-non self, will-matter, unity-diversity, love-hate birth-death, evolution-involution, descent-ascent, Srusthi and Samhara. How do we judge a culture asks Sri Aurobindo. The greatness of a culture lies in the manner it tries to effect a ‘natural harmony of spirit, mind and body.’ Spirituality is the keynote of Indian culture although others have also had spiritual components to their own. All cultures go through the stages of conflict, competition, concert and finally the spirit of sacrifice and mutual sharing. A necessity to sustain an organisation of the individual and collective life for gradual progress. While the Chaturvarna in its intention may have envisaged a flexible structure of the four fold order, Sri Aurobindo is firm that the caste system of the later period was an utter caricature and ought to be discarded. He makes no compromises regarding systems he sees are outmoded and therefore must be cast off completely. The mentality of the West has long cherished the aggressive and quite illogical idea of a single religion for all mankind, a religion universal by the very force of its narrowness, one set of dogma, one cult, one system of ceremonies, one array of prohibitions and injunctions, one ecclesiastical ordinance. That narrow absurdity prances about as the one true religion which all must accept on peril of persecution by men here and spiritual rejection or fierce, eternal punishment by God in other worlds (IR: 146). What then is the conception of art here? Since the defining features of Indian culture is the realizing of the underlying unity of life and the dominant spiritual motif, as argued by Coomaraswamy and Sri Aurobindo, then art should be an integral part of the national spirit. In the Vedas, Coomaraswamy tells us, the practice of art is viewed as ‘a form of Yoga’ (DS: 24). Art is viewed in deeply psychological terms. For instance, Agni Purana draws a connection between dream and art. The practice of visualization as referred by Shankaracharya is seen identical in worship and art (DS: 27). The artist in order to be effective must realize four required moods of friendliness, compassion, sympathy and impartiality (DS: 27). He must meditate upon Shunyata or non-existence of all things. For, Yoga is ‘not merely a mental exercise or religious discipline, but the most practical preparation for any undertaking whatever’. For instance, Hanuman prays to the Gods before he attempts to rescue Sita in the Ashoka grove. In other words, art, ethics and spirituality go hand in hand in this scheme of things. The aesthetic emotion — Rasa — in the spectator Rasika is carried through determinants (Vibhava) in Croce’s’s words ‘physical stimulants’ to aesthetic reproduction, consequents (Anubhava), ‘deliberate manifestation of feelings as gestures etc.’, mood (Bhava) 33 in number, ‘induced in the characters by pleasure and pain,’, ‘involuntary emotions’, (Satva Bhava) ‘emotional states originating in the inner nature. For the work of art to produce Rasa, one of the permanent moods must form a master motif in which all other expressions of emotions are subordinated. Degree of excellence in poetry is discussed in Kavya Prakasha and Sahitya Darpana. On the other hand, early Buddhist art is popular, sensuous and animistic. Gandhara art is a mixture of the Eastern and Western formula. ‘Buddhist primitive’ art exists in Amarnath in India and Anuradhapura in Ceylon (Sri Lanka), thanks to ‘energy working in greater isolation’. For Coomaraswamy, the dance of Shiva is a manifestation of primal rhythmic energy that represents Shiva’s main activities: Srusthi, Sthithi and Samhara. The dance is also symbolic of the world cycle. In turning to music, Coomaraswamy sees a similar difference in the attitude to music in the cross-cultural context. There is the European tradition of ‘Chamber music of an aristocratic society’ vis-a-vis temple music where the musician is the ‘Servant of God.’ We can understand this tradition with the help of Raga and Ragini. The Raga is a selection of five, six or seven notes distributed along the scale but the Raga is more particularized than a mode, for it has certain characteristic progression and a chief note to which the singer constantly returns.’ (DS: 90). Ragas are associated with rhythmic ritual of daily and seasonal life. The examples cited here are most telling. There is the parable of the singer who was forced to sing the Deepak Raga, and tragically burst into flame, and the equally symbolic tale of Narada who sang badly and the musical notes in the form of men and women lay ‘weeping over their broken arms and legs.’ (DS: 92). After all, the ‘Indian singer is a poet and the poet a singer.’ Indian music is essentially impersonal. Sri Aurobindo has a relatively smaller but equally significant body of art criticism that has been mentioned earlier. Of the art forms he does a closer analysis of forms of fine arts, sculpture and architecture while mentioning music in passing. Of literature, literary theory and criticism, he has written plentifully in his Future Poetry, earlier cultural writings and in his letters to poet disciples. Although not trained formally in the artistic tradition, Sri Aurobindo was exposed to the best of the Western and Indian art during his education in England as well as his Baroda days. He kept himself abreast of developments in art especially regarding the Bengal School of Art. It is in the series of essays under what came to be known as The National Value of Art that Sri Aurobindo defines his concept of aesthetic nationalism. ‘The first and lowest use of art’, says Sri Aurobindo ‘is purely aesthetic, the second is the intellectual or educative, the third and highest the spiritual’. (ECW: 439). Each plays an important role. The aesthetic aspect of life is of crucial importance. He observes: ‘We do not ordinarily recognize how largely our sense of virtue is a sense of the beautiful in conduct and our sense of sin a sense of ugliness and deformity in conduct’. (ECW: 442). However, ethics and aesthetics have had a troubled relationship in the West. There were four gradations Sri Aurobindo says in the Greek ethical thought — ‘the euprepis, that which is seemly or outwardly decorous, the dikaion, that which is in accordance with dike or nomos, law, custom, standard of humanity based on the sense of fitness…, thirdly the agathon, the good based partly on the seemly and partly on the just and lawful, and reaching towards the purely beautiful; then finally the supreme kalon, that which is beautiful, the supreme standard… The progress of ethics in Europe has been largely a struggle between the Greek sense of aesthetic beauty and the Christian sense of higher good (ECW: 443). Sri Aurobindo brings to bear on his essays and reviews such as ‘Two Pictures’, ‘Indian Art and an Old Classic’, ‘The Revival of Indian Art’, ‘Rupam’ and ‘South Indian Bronzes’, his understanding of a spiritualized aesthetics and the role it can play creatively in the new Indian nation. And thus in “Shama’a” edited by Mrinalini Chattopadhyay, he singles out the English artist, J. D. Fergusson’s ‘Rose Rhythm’ and the accompanying article on his work by Charles Marriot. Sri Aurobindo finds in this portrait ‘a strong psychical truth’. ‘The impression given is the materialisation of a strong and vivid astral dream.’ The difference between this and the psychic manner in which the East will at once appear’ by turning to the ‘gracious and subtle Indian painting’ in the first number. (ECW: 626). To conclude: Ananda Coomaraswamy and Sri Aurobindo manifest close parallels and some differences with regard to culture and nationalism. Products of the modern West, both critics turned to Indian sources for fashioning out a new national imaginary. Decolonisation was central to both. Yet both rejected forms of nativism or insular chauvinism. Instead, they espoused a cosmopolitanism firmly rooted to a critical understanding of Indian traditions. Coomaraswamy spent most part of his career in the West with western companions. Sri Aurobindo after early life in Baroda, and an active political life (1905 – 1910) in Bengal, retired to Pondicherry to ‘the cave of Tapasya,’ where with the French mystic Mirra Alfassa, he worked out a new destiny for mankind, based on his theory of a future evolution of Man. While Sri Aurobindo is more versatile in a multi-disciplinary context, and takes up art criticism as part of his larger oeuvre, Coomaraswamy’s knowledge of the history of arts is more focused and professional. Between the two, Coomaraswamy appears to be somewhat conservative in some areas of social living, yet both of them pioneered a radically new approach in the first half of the 20th Century. Although periodic assessment of the Bengal Renaissance continues to be made, art historians and critics need to make a similar evaluation of the contribution of early critics of Indian Art against the backdrop of Swaraj in ideas. Sadly, both Sri Aurobindo and Ananda Coomaraswamy are neglected today, much to the detriment of theory and cultural criticism. It is hoped that a renewed interest in both vis a vis the role of the arts will help create a new meaning for the intellectual thought of modern India. Note: An earlier version of this essay was presented at the national seminar on Ananda Coomaraswamy at the Department of Philosophy, University of Hyderabad, Feb 3-5 2011.I thank the Department of Philosophy especially Professor S.G. Kulkarni for inviting me to present this paper. Aurobindo, Sri. 1993. India’s Rebirth, Mysore: Mira, Aditi Centre. Aurobindo, Sri. 2003. Early Cultural Writings (ECW) (The Complete Works of Sri Aurobindo, Vol. I). Pondicherry: Sri Aurobindo Ashram. —– 1959; rpt. 1998. The Foundations of Indian Culture. Pondicherry: Sri Aurobindo Ashram. —– 1997. Essays Divine and Human. (The Complete Works of Sri Aurobindo, Vol. 12). Pondicherry: Sri Aurobindo Ashram. Barthes, Roland1977. Image, Music Text. London: Flamingo. Coomaraswamy, Ananda K. 1918. The Dance of Shiva, Fourteen Indian Essays. New York: Sunwise Turn Press. —– 1989. What is Civilization? New Delhi: Oxford University Press. Giroux, Henry A.1992. Literarcy, Pedagogy and Politics of Difference’. College English. 19-1. Greenblatt, Stephen J. 1991. Marvelous Possessions: The Wonder of the New World, Oxford : Clarendon Press. Heehs, Peter. 1989. Sri Aurobindo: A Brief Biography. New Delhi: Oxford University Press. Hill, Patrick J.Hill.1991. ‘Multiculturalism: The Crucial Philosophical and Organizational Issues’ Change, July /August. Havell, E.B. 1972. A Handbook of Indian Art. Varanasi: India Academy. Kernan, Alvin.1990. The Death of Literature, New Haven and London: Yale University Press. Mohanty, Sachidananda.2008; 2009,2010..Sri Aurobindo: A Contemporary Reader, New Delhi: Routledge India, 2008;rpt.2008,2010. Parekh, Bhiku 1999, ‘What is Multiculturalism? Seminar ed. Gurpreet Mahajan.wwww.india.seminar.com.parekh.htm. Reising, Russell J. The Unusuable Past, Routledge and Kegan Paul. Said, Edward.1985.Orientalism Reconsidered’, Cultural Critique, I Fall. Woodroffe, John Sir.rpt. 2010. 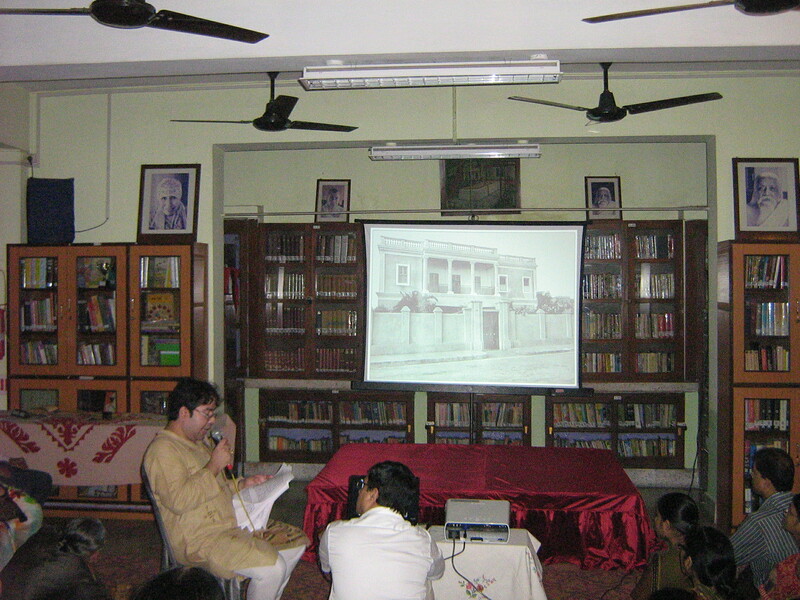 Delhi: Shivalik Prakashan. About the Author: Dr. Sachidananda Mohanty is Professor, Department of English, University of Hyderabad. He is the recipient of several national and international awards including those from the British Council, the Salzburg, the Katha and the Fulbright. He has to his credit 21 books in English and in Oriya including D.H. Lawrence Studies in India, Writers’ Workshop,1990, Lawrence’s Leadership Politics and the Defeat of Fascism, Academic Foundation,1992, Understanding Cultural Exchange, Vision Books 1997, Literature and Culture, Prestige, 2000 Travel Writing and the Empire, Katha, 2002; rpt. 2003, Early Women’s writing in Orissa, 1898-1950: A Lost Tradition, Sage Publications, 2005, Gender and Cultural Identity in Colonial Orissa, Orient Longman 2008, and Sri Aurobindo: A Contemporary Reader, Routledge India, 2008; 2009. His essays and articles have appeared in some of the leading journals and forums in the country including India Today, The Hindu, The Indian Express, The New Quest, The Book Review and Economic and Political Weekly. 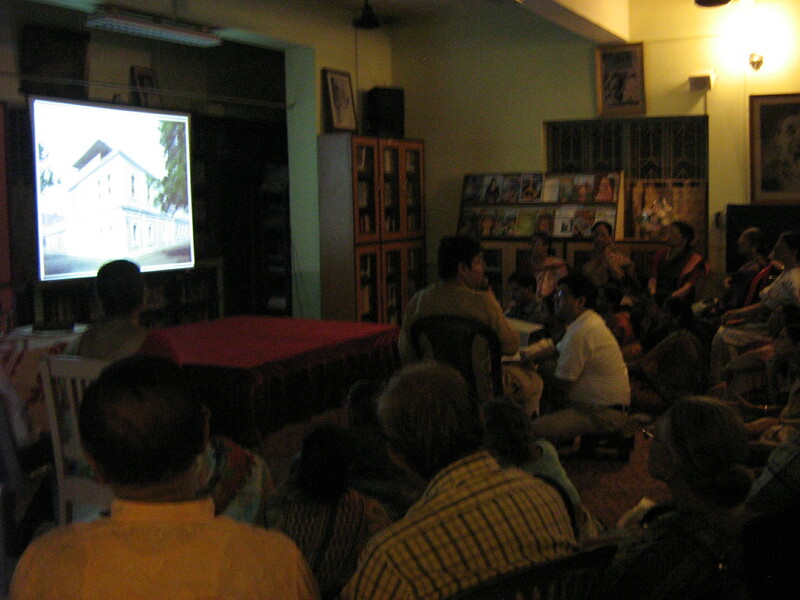 Sri Aurobindo Sakti Centre Trust and Overman Foundation had jointly organized an audio-visual presentation on Sri Aurobindo titled “Sri Aurobindo in Pondicherry” on Thursday, 1 August 2013 at 6.30 p.m. in the premises of Sri Aurobindo Sakti Centre located at P—532, BLOCK “M”, New Alipore, Kolkata 700053. 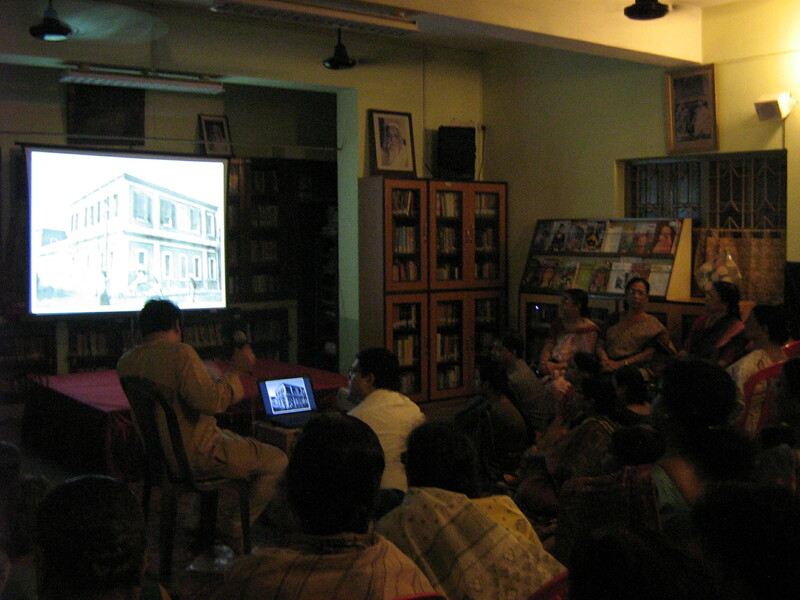 This audio-visual presentation which was perhaps the first of its kind held at Sri Aurobindo Centres in West Bengal chronicled the entire period of Sri Aurobindo’s life from 1910 to December 1950 with the help of 154 photographs (some of which were quite rare) and narratives through a slide show. Based on a script prepared by Mr. Anurag Banerjee, the said presentation was conducted by Mr. Partha Sarathi Bose (Managing Trustee, Sri Aurobindo Sakti Centre Trust) and Mr. Anurag Banerjee (Founder, Overman Foundation). A special attraction of the programme was the rendition of two recorded songs on Sri Aurobindo and the Mother composed and sung by the great musical maestro Dilip Kumar Roy. 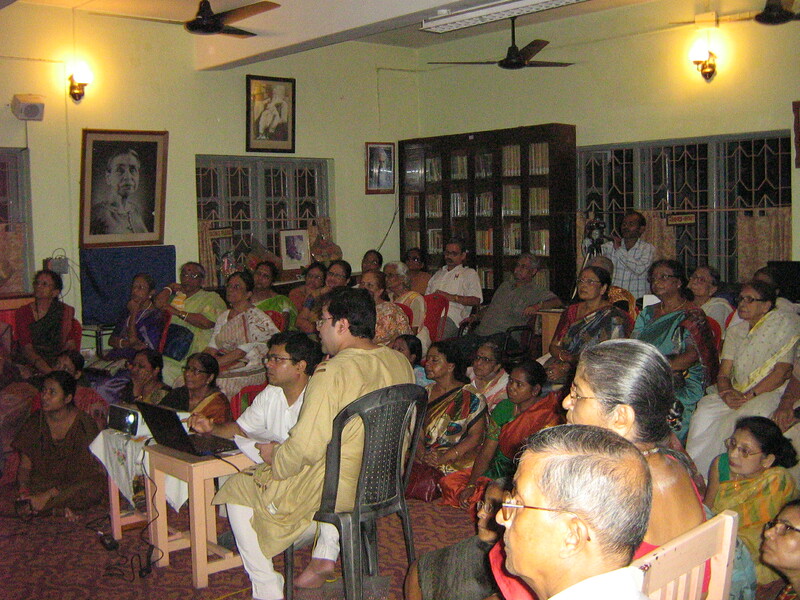 The programme—which witnessed the presence of senior Aurobindonians like Dr. Jaganmoy Banerjee, Dr. Amartya Kumar Dutta and Mr. Subroto Sen (Secretary, Sri Aurobindo’s Action, West Bengal)—had generated a great amount of interest among the audience. Paul Antoine Richard was born on 17 June 1874 at Marsillargues, in the department of Hérault, in Languedoc (southern France). After finishing school, he enlisted in the army, and in October 1892 was sent to North Africa, where he served for four years. Returning to his homeland in 1897, he settled in Montauban (in the South-West of France), where he took up the study of theology. He preached in Montauban for two years, and in 1900 published a book-length “metaphysical essay”, Le corps du Christ après sa resurrection. Later in 1900 he became a member of the Reformed Church of France in Lille (in the North-East of France, near the Belgian border). Around this time he married Wilhelmine van Oostveen, a young lady of Amsterdam. Richard received his law degree from the Académie de Lille in July 1908. Before long he became a barrister at the Paris Court of Appeals. But his eagerness to enter into the world of politics was very much alive and therefore in February 1910 he joined the Ligue de Défense et de Propagande Républicaine Radicale et Radicale-Socialiste. In 1910 he visited Pondicherry and met Sri Aurobindo. On 5 May 1911 he married Mirra Alfassa alias the Mother. He returned to Europe after his divorce from the Mother; later he went to the United States of America where he taught as a university professor. His published works include To the Nations, The Lord of the Nations, The Scourge of Christ, The Dawn Over Asia, The Challenge of the Future, To India: The Messages of the Himalayas, New Asia, Messages from the Future, The Eternal Wisdom and The Seven Steps to the New Age. In 1967 Paul Richard breathed his last. On 19 February 1951 an interview of Paul Richard conducted by Prof. Bhagwat Sharan Upadhaya was published in the Amrita Bazar Patrika. This interview has been published in the online forum of Overman Foundation. We are immensely thankful and grateful to Shri Suresh Tyagi for tracing this interview and sharing it with us. Prof. B.S. Upadhaya, an eminent Indian scholar who is at present touring the United States on unofficial cultural mission, has been meeting distinguished personalities there. The following is an illuminating account of his interview with Paul Richard, the celebrated author, thinker and mystic. The writer who has very ably covered the whole range of modern problems philosophical, social and political and all the human issues at stake, in his questions to the great philosopher, has elicited striking answers. “The U.N.O. is a mixture of nations and super-national unions—sheep and their rival shepherds leading them to be slaughtered”, observed the philosopher replying to the query about U.N.O.’s future. Besides, the interview is a re-avowal of Paul Richard’s abiding love for India and Asia and reiteration of his theory of Asiatic Monroe doctrine. This is the first of a series of articles by Prof. Upadhaya. On the 24th November 1950, exactly at 10 a.m., I walked from the Elephant House into the single-chambered, neat little Chalet of Mr. Richard. He was already up despite the cold severity of the morning, and leaving his bed on which he sat meditating on human problems, he moved to his chair and smiled at me. The smile accorded me a warm welcome although I felt it had a mocking significance for he hates interviews, is difficult to interview, and he knew the purpose of my visit. “To trouble you—”. I agreed. Q. And did you find wise men when you went East? A. I found all sorts of men, some wise, some fools—or looking so to the unwise. Q. May I ask who they were? A. Oh, what is the use of naming them? Great names are known to all. But as Romain Rolland once wrote to me, “There are those as much perfected and perhaps still more divine, having remained unknown to fame, more intimate with God”… The greatest ones are the humblest. Q. Do you think the West is decaying culturally and politically? A. When a civilisation reaches its period of decline, all its aspects are affected. Q. How do you view the machine age? A. The machine is the outcome of what has been named the industrial revolution. As all great creative forces, it accelerates the downfall of those cultures which refuse to be renewed, and the ascendance of the rising ones build on new foundations. The machine enslaves or liberates man. It can create in feudal and individualistic systems, unemployment and starvation for the many; and in new progressive ones, increasing leisure and possible culture for all. A. Asia and India? They have already given all that they had, all that their great past has produced—and the rest since then has been plundered. They have been robbed while they slept. Now they have to create again so that they can once more enrich others and give to the world what it needs most: the wisdom of new seers. It is what Asia and India are prepared to do as they awake in this great dawn of their new civilisations. Q. What is the fundamental difference between the Eastern and Western culture? A. Human culture is one. It is the spirit of man throwing great waves of light from East to West and from West again toward East. And all cultures in succession hand to each other the flaming torch of human advance some, as the old Indian one, mustering the inner, spiritual world, and others, as the present European one acquiring the outer knowledge for the conquest of the hidden forces of nature. Our great hope and endeavour is for a future world culture, unifying mankind, integrating in a transcendental realism the science of the universe around us and the wisdom of the Infinite within us. Q. What part can the past play in shaping the present and the future? A. Past and future are one, and the present is made of both. Nothing is more ancient than the future: before there were any past the future was. And nothing is more present than the past. For the present is but the past in a new form. The living past is present in us, and there is no need to save its dead forms—the empty shells left on the shore, which can never be revived. History of the past is useful only when it throws its light on the shapes of the future. It is the lack of faith, the fear of the future, which makes people turn toward the past—the grossest form of impiety. Running after the setting sun is the most foolish enterprise. Its rays are lost forever in the empty space. But the same sun which set yesterday will rise to-morrow. And it is towards its new rays—the only real ones—in the opposite direction, that we must turn to be wise. Q. Do you believe in God or in any equivalent of the God idea? A. I believe as Thales that “all is full of God”. There are principles and prototypes of every kind of potential existences in the infinite: group soul, gods of species, of tribes, nations, of religions, civilisations, ad infinitum. But none of them is the Supreme. There is no Supreme in the infinite—no Supreme but the infinite. Even the greatest god is infinitesimal in the Infinite. The greatest means the most humble, the most in-existent. It is human ignorance which identifies its own god with the Infinite origin, which makes its god ignore the Infinite. For, the species and its group-soul, its god, have the same relation as a periphery and its centre: they create each other. And the god shares in the self-limitation of its worshipper. The gods share in the sin of man: his exclusive self-assertion, his denial of the infinite. That is why as men themselves they become mortal. To worship a god is to participate in its final doom. To deny is to save him, to restore him to the infinite. Q. Does it mean that you side with the atheist against the religious believers? Q. What do you think is the solution of the erstwhile ailing humanity? …not transcended itself. He is still supreme, having not yet, as all other species, produced above himself a higher form of being to which he can ascend. As long as he will thus remain supreme he will remain tormented, in the throes and travail of inner super creation. The only salvation for man is—the superman, the supramental ecstatic being. Those who are conscious of that make the inner torment creative and refuse to take part in the mad fury and blind destructiveness of the race. Q. What is the purpose of philosophy? A. The same purpose as lighting a lamp in darkness. Q. What is your idea about conjugal relationship? Must marriage continue? A. I cannot see why or how it should or could be stopped. My idea is that all forms of union which have been sanctioned and sanctified by any human community should be respected and accepted by and within all. Man sums up all nature. Monogamy, polygamy, polyandry have an equal right among animals (curiously, the most ferocious animals—lions, tigers, bears, are monogamous and the most peaceful ones—deer, elephants, cows—are polygamous. The most common—cat, dog are promiscuous). But among human beings, the conjugal relationship, whatever may be its social form, can become a holy conscious participation in the universal rite of union of the opposites, whose oneness in the infinite becomes bipolarity in the worlds of form. And through each other man and woman can worship thus the Infinite One in its dual aspect. This is the essence of true marriage. A. This means in reality “art for the artist’s sake”, and so becomes the selfish, anarchical, exhibitionist art of decaying cultures. True art is individual art for the sake of public service—an intelligible expression of the collective ideal and inspiration: a living art in opposition to the dead art of galleries and museums—which are its mausoleum. Q. What should be the function of those who think and create?—the philosopher, historian, scientist, artist and litterateur? A. Those who think and create, in whatever sphere and country, are rare. Their function is the same in the social organism as the function of what thinks, creates, imagines in the individual body. They are the brain of the collective being—at its head in growing cultures, at a loss in the dying ones. Q. Do you believe in international culture and world political organisation? How will you arrange the world of to-day politically? A. I wish I could forget for a little while about those big problems. For I have just sent to my old friend Ganesh & Co., in Madras, a book to be soon published: “The Seven Steps to the New Age”, answering fully those questions. It includes as an appendix a project of an International League of World Culture. Q. What is your opinion are the good points of the Soviet culture? What is desirable? What do you think of modern democracy? A. All cultures are welcome. They must not be judged on their first appearances. As long as they remain dynamic their forms change and progress. I like their daring faith which makes them discard the past, sacrifice the present, in order to gain the future. Their destructiveness is proportional to their will and capacity to create. They are the dark mountain behind which the new sun rises. I like also the way in which they give cultural autonomy to their backward tribes in central Asia, encouraging them to develop their own language and traditions. “Modern” democracies are anything but modern. They refuse to become so through deep renewals. To a world desperately in need of change, their forceful stand for status quo gives no other alternative than the acceptance of what they have tried to destroy. Q. We have a world organisation—“The United Nations”. Are you satisfied with its structure and working? Do you think it will meet the fate of the League of Nations? A. Who is satisfied with the U.N.O.? All organisations around it are a success, but their center at Lake Success is a failure. The League of Nations was a league of empires and would-be empires among the nations—a gathering of foxes and fowl. The U.N.O. is a mixture of nations and supernational unions—sheep and their rival shepherds leading them to be slaughtered. For both organisations beautiful “Taj Mahals” have been built, one in Geneva, the other in New York—in memorial. Q. You are a world citizen and humanist, above petty national profiteering; but tell me your reaction to the French conduct in Indo-China. …pity on these oppressed people). And I persuaded Mahatma Gandhi to make the National Congress at Ahmedabad adopt my plan for a League of Asia, with this motto: “Freedom and Unity of Asia”. I rejoiced when the first Asian Conference met in Delhi to back Indonesia in her fight. I wish another conference could do the same for Indo-China. And I hope that some day a Pan Asian union will declare the equivalent of a Monroe Doctrine for Asia. Q. Is Great Britain still a force in Europe? What game is she up to? A. The case of England is still uncertain in many respects—except one: since she has ceased to “rule the waves” several of her colonies have begun to waive the rule. She will therefore gladly change her colonial for a continental empire. But being unable to do so she has only this alternative: either to become a province of Europe or an appendage of America. Her diplomacy consists mainly in avoiding as long as possible the choice. Q. Which aspect of Indian life and what Indians have influenced you? A. One thing only influences me, my deep inner link with things and people. Many things link me with India: the Brahmin motto for “plain living and high thinking”, the respect for all life, and above all the deep philosophical and spiritual sense of the Infinite. And many people—all of them now gone, some recently: Aurobindo, Dwijendranath Tagore and his younger brother Rabindranath, Gandhiji and Jagadish Bose—others long ago, the Rishis of the Upanishads, and among them the Buddha and Mahavira. But none of them is dead. They live forever. They will always have new things to teach us. Q. What kind of writing do you value? Philosophy, mathematics, science, literature? Which writers have you liked? A. I value all writings which are creative. And the kind of style which condenses the maximum of thought in the minimum of words: the equivalent in philosophy of the mathematical equation in physics, embodying in a few symbols universal constants, laws and harmonies of nature. My preferred form of expression is an epigrammatic equivalent of the old “sutra”. (My last books are made of thoughts in twelve words.) The writers I have liked are those who deal with the riddle of the universe, the destiny of man, the progress and peace of mankind. The enumeration would be too long of the authors, ancient and modern, that I have admired: all those dealing with the three great problems—misery below, mystery beyond, mastery within. Q. Which country do you like best and why? A. The Himalayas, aloof and pure above the world, linking in Central Asia the three Asian giants: India, China, Russia and their new rising cultures. Q. What do you think of Japan, her resuscitation and future? A. I like Japan. I have spent four years, which are unforgettable, in close association with the true Japanese soul. It is a soul of great refinement and heroism, of endurance and fortitude, self-control and nobility. It has several cultures, the Chinese, the Hindu and the European. It will also digest the forcible feeding of the American—and reject what of it can not be refined. It has fallen, trying to imitate the West and to conquer Asia instead of liberating her. It pays now the price of this fault. It will someday repair it. Q. You are old now. You can look back and tell the stages you have covered. Do you think you have realised your goal? What is your wish regarding yourself? Have you any particular desire remaining unfulfilled? A. I do not feel old. I am still but a growing child. The stages I have covered are two: I spent the first part of my life in religious research and I have achieved for myself a synthesis of religions, so that now I belong to none but they all belong to me. I have spent the second part of my life trying to find in a philosophy of new physics a material basis for my thoughts and a common root between science and religion. In the deep communion with the Infinite, beyond and within, is this common root, linking the external with the eternal. To probe there within the hard shell of matter and beyond the horizons of the mind, a discipline is necessary which through integration of the opposites changes mental concepts into supramental “trancepts”. In these, glimpses of the infinite oneness can be seen. Did I thus realise my goal? Certainly not. For it recedes while I advance, opening new magnitudes to penetrate. Have I a wish for myself? To be nearer and nearer to the radiant heart of things. A desire unfulfilled? That of fulfilling my unfinished work. And perhaps also to see a new world take shape—for the new man. Q. Do you like India? Would you like to go out to India? What would you do there? A. I like India—the India of the past and that of the future, the India which was and will again be. I go there very often in thought and spirit. What would I do there? What I always did and will do: serving through India, Asia, and through Asia, the world—a new Asia and a new World. Q. Have you any message that you would like to communicate to the East or any warning to the West? A. If the West does not listen to the warning of circumstances, how can it care for that of the man? And what message could the East need that it has not heard in its own heart: the message of its great future already present in its inner self. To India I can only repeat what I said thirty years ago: “The most dreadful tyrannies is that of dead creeds, and the worst autocracy that of theocrats”. Paul Richard is a great thinker, mystic, philosopher and humanist. He has been a friend of Mahatma Gandhi, Rabindranath Tagore, Romain Rolland and Sri Aurobindo. He has always believed in the Asian leadership of the world and in the wisdom of the Indian rishis. He is one of the greatest writers of the age and his style is pithy and sententious, very akin to the structure of the Sanskrit ‘sutras.’ Indians are familiar with his works—To the Nations, Au Japan, The Dawn over Asia, The Lord of the Nations (translated by Sri Aurobindo into English from the French original), To India, The Message of the Himalayas, To the Women, Messages from the Future, New Asia. The great author is constantly writing and it is for this reason that he has moved now from the city of New York to the solitude of Nyack which he calls “Benares on the Hudson.” He is tall and handsome and bears himself erect at his age of seventy-six. His grey hair and beard become his sharp features and make his mien very distinguished looking. He wears a perpetual benevolent smile which beams across the well-trimmed beard on his visitor. He has the most acute mind whose brilliant and ruthless logic has not been affected by age. His humour is scintillating and satire sharp and deep. Paul Richard has been a great traveller and has been almost all over the world in search of wisdom. The following is a brief record of his travels, mostly gleaned from his talk. He chose military service that he might be drafted to distant lands and he was sent to North Africa. There he became a real Arab and spoke and wrote Arabic. He was commissioned in 1905 to go to French Guiana and stayed in South America studying the life of the convicts. He was given two murderers for servants whom he made his friends. In 1910 he went to India and met at Pondicherry a kindred soul, Sri Aurobindo, who had just escaped from Calcutta. He visited India a second time in 1914 with his wife and in collaboration with Sri Aurobindo started the “Arya”. The Pondicherry Ashrama of Sri Aurobindo coming into being, his wife became its ruling spirit and kind Mother. He had already met Tagore in Japan and now Dr. Besant and Gandhi invited him. He met the former at Adyar and the latter at the Nagpur session of the Indian National Congress, addressed Ahmedabad Congress in 1922. Mahatma Gandhi took him to the Sabarmati Ashrama where they conversed before prayer. Their ideas were in considerable agreement in principle though not in detail. After touring Sindh and Kathiawad, Mr. Richard took a boat at Bombay and sailed to Basra, visited Baghdad and Ur, the ancient capital of the Chaldeans. He then crossed the Syrian desert to Haifa in Palestine and stayed for a month in the room of the Persian prophet Abdul Baha. He then spent some time at Cairo writing editorials for the French paper “La Bourse du Caire” and reached France via Greece and Italy. The impending doom over Europe was becoming more urgent every day and finding that there was nothing to do in France, he crossed to America in 1929 which, he thought, although had no past would perhaps have a future. He returned to France in 1930 but on arriving he could not stay in Paris longer than twelve days, and finally bidding goodbye to France left for America again. And since then he has stayed in America twenty years working on philosophy of new physics and integrating philosophy with science. But finding America preparing for war, he wishes to go out again to India, the land of his dreams and one country really given to peace.